In this morning Tip of the Week, I write about the importance of serve variety. Yes, I'm trademarking the term "topspinny." Any time you say it, you have to pay me a quarter. (To the humor-challenged: I'm joking.) I like to use the term to describe players who use a lot of topspin on their backhands, as opposed to others who hit flatter, such as myself. Flat backhands used to be the norm, but these up-and-coming junior players are mostly taught topspinny backhands, sort of half drive, half loop, right off the bounce. I can demonstrate the shot easily, but I don't naturally use it in a match, not after 35 years of hitting "normal" backhands. The shot is highly effective; the ball just jumps at you like a normal backhand loop, with all the quickness of an off-the-bounce flat backhand. So you want to be good at table tennis? Then learn about Deliberate Practice. Not everyone can put in 10,000 hours and be great, but if you apply the other seven principles in whatever practice time you have (make time), you can really improve. And the hours do add up. Below are the eight main principles; the article elaborates on them. Why not print out the article's eight main points with short explanations (they'll fit on one page), and put it on your wall where you can see them regularly? Deliberate practice is highly demanding mentally, requiring high levels of focus and concentration. It is designed specifically to improve performance—to strengthen it beyond its current levels. It must continue for long of periods of time. It requires continuous feedback on results. It involves self-observation and self-reﬂection. Have you been practicing your serves? (Yes, I like to ask this question on my blog every couple of weeks or so, which should indicate its importance.) 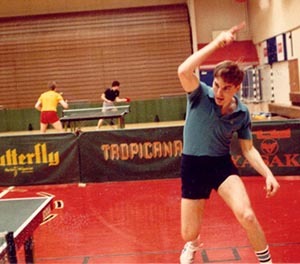 At any time, can you (or your students) serve short or long, with sidespin going either way, with backspin or topspin, or with no-spin, to all parts of the table? 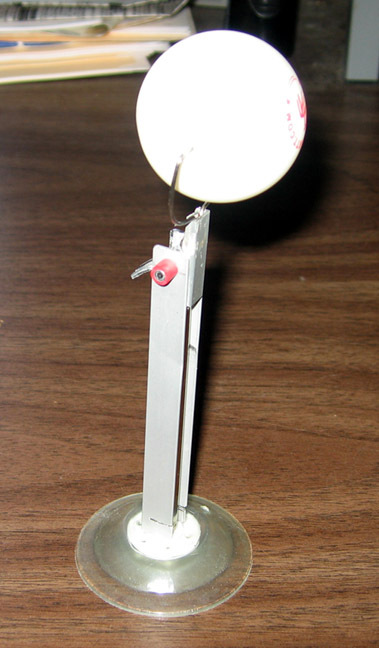 Can you disguise these spins? Can you also serve fast and deep with varied spin (or no-spin) to the corners and middle? If the answer to any of this is no, get practicing! One thing I've noticed in the two-week MDTTC camp we're running is that a lot of players hunch or tighten up their playing shoulder when hitting forehands. I'm almost ready to make a recording that says, "Drop your arm to your side. Relax the shoulder. Now bring up your arm to a forehand position, keeping the shoulder relaxed. Bend the elbow to bring the racket into position. Now hit your forehand!" Another common shoulder problem is not rotating the shoulder on the forehand. If you have your back foot slightly back (no more than 45%, often much less), and rotate your shoulders so you are looking sideways, you suddenly have a huge forehand hitting zone. If you don't do this, then you are jammed in the front of the hitting zone with little room to backswing. When you are getting ready to loop a push, are you thinking forehand, backhand, or something in between? This Tip of the Week covers the four mental states you should be in. Hitting at 100% versus 80-90%. We're in the middle (well, 30% in) of a two-week training camp at Maryland Table Tennis Center, Mon-Fri this week and next week. Coaches at the camp are myself, Cheng Yinghua, Jack Huang, Jeffrey Zeng Xun, and Sun Ting. We had a competition yesterday where I set up ten paper cups on the table, bowling pin fashion, and players were given ten shots to knock off as many as they could, with me feeding the balls mult-ball fashion. Whoever knocked off the most would win a free drink. Two players knocked off nine, and so they had a playoff. One kid again knocked off nine in the playoff. The second kid, Chetan Nama, had knocked off eight, and had one shot left. Then, with everyone screaming, with his last shot nailed the last two cups to knock off all ten and win a free Gatorade! Why do beginners aim up?